Dr. Adam R. Keeler is originally from Mount Pleasant, PA. He earned his B.S. degree in Physics from Saint Vincent College in Latrobe , PA where he graduated with honors at the top of his Physics class. He continued his graduate work at Sherman College of Chiropractic in Spartanburg, SC. In addition to graduating with honors, Dr. Keeler won the Milton W. Garfunkel Award, the highest award given to each graduating class for having exhibited superior abilities in the academic, clinical, and philosophical aspects of chiropractic, and having demonstrated a high degree of commitment to the college community. Dr. Keeler also won the B.J. Palmer Philosophy Distinction Award, an award given to him for communicating the message of chiropractic through the care he gave his patients. During his internship, Dr. Keeler was recognized for his dedication and professionalism to his patients and was honored by being named Intern of the month. He was also an X-Ray Intern Specialist who oversaw all x-rays taken during his duty at the clinic. In 2010, Dr. Keeler developed a thermography scanning software/hardware system and x-ray facilities for his office. These advancements in the chiropractic field were so state-of-the-art that you can now find his patented technology in use across the country as well as overseas. Dr. Keeler is also board-certified and holds a license to practice in Pennsylvania. 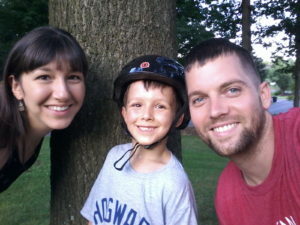 He currently resides in Chambersburg, PA with his wife, Melissa, and son, Eli.